YEP- Market Assistance Programme. Click here for more information about my project. Euphresia hopes to continuously widen the application of relevant and successful models/best practices to enrich the existing development approaches on WASH issues in rural and peri-urban areas. 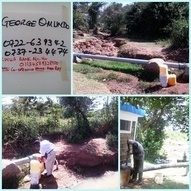 She is a member of Kenya Young Water Professionals and Water Youth Network Movement. Education: Euphresia holds an Msc. In Education for Sustainability from the London South Bank University, a Bachelor’s Degree in Environmental Studies Community Development from the Kenyatta University and is also trained in Integrated Sustainable Water and Sanitation Management in Urban Areas. Euphresia has experience in networking; knowledge development and management; partnership building; community advisory services in WASH. Before joining SNV Euphresia worked at the United Nations University as a Programme Officer in the Education for Sustainable Development in Africa Project. She has a track record of achieving results while working with communities using comprehensive development solutions.